Is sublingual immunotherapy scientifically proven? A Cochrane Collaboration meta-analysis reviewed 22 studies involving 979 patients receiving sublingual immunotherapy and concluded that sublingual immunotherapy is a safe treatment which reduces symptoms and medication requirements in allergic rhinitis.1 SLIT is also affirmed by the World Health Organization and the ARIA guidelines (Allergic Rhinitis and its Impact on Asthma). In addition, our studies show that more than 80 percent of allergic patients and 90 percent of asthmatics report marked symptom relief within the first few months of using the AllergyEasy® program. To read more sublingual immunotherapy research, click here. Sublingual allergy drops contain the same all-natural antigens found in shots. However, because drops are not associated with the same degree of risk for anaphylactic reaction that shots are, they are safe enough to be taken at home.2 Allergy drops for kids have also been shown to be safer at younger ages than shots are. Are allergy drops for kids? Studies have shown sublingual immunotherapy to be a safe and effective pediatric allergy treatment–even for kids less than 5 years old.3 That’s a marked improvement over shots which are often reserved for children 7 and older. How long will it take for patients to see results with AllergyEasy? 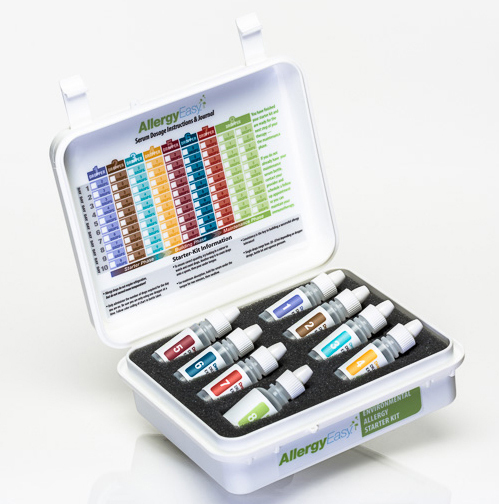 The majority of AllergyEasy patients experience marked symptom relief within the first few months of starting treatment. Many patients see improvement in as little as a few weeks. Each patient is unique, and individual results may vary. Consult a sublingual immunotherapy clinic for an initial consultation. How long has sublingual allergy medication been available? Will insurance cover sublingual immunotherapy cost? Many insurance plans cover the cost of allergy testing and associated physical examinations/office visits. Fewer insurance companies cover the cost of allergy drops; however, many patients find that it can be cheaper to pay cash for the cost of sublingual immunotherapy than to pay the actual co-pays for allergy shots. Less trips to the doctor’s office can be an added time and money saver when considering the the cost of allergy drops as prescribed by a sublingual immunotherapy allergist. I’m going on vacation. Can I take the serum with me? Yes! Sublingual immunotherapy drops are ideal for frequent travelers. The serum’s portability and self-administration allow patients to maintain desensitization while on the road. And for patients traveling by air, our dropper bottle is less than 3 ounces in compliance with current TSA regulations. I’m moving. Will the serum still protect me in a new place with different allergy sources? The allergy drops are extremely comprehensive and designed to protect patients from most common allergens from around the world. So whether you are in Arizona or New York, Dublin or Sydney, you can expect extensive allergy protection. How do the sublingual drops work? With shots, allergy serum is injected into the skin and absorbs into the bloodstream. With sublingual drops, the serum is placed under the tongue where it can be easily absorbed into the bloodstream through special cells in the mouth. The drops can be prescribed by a sublingual immunotherapy doctor. What are the drops made of? They are made of common antigens found in nature (the things you breathe in on a daily basis) in a liquid saline solution. Do allergy drops work for food allergies? Many AllergyEasy clinics now offer food allergy treatment drops that cover 59 different food items. To learn more about wheat, egg, milk, and nut allergy treatment and more, click here. What if I’m pregnant? Can I still take the allergy drops? I wasn’t allergic as a child. Why did I suddenly develop allergies? Allergies can occur anytime from infancy to old age. Even if you wouldn’t have needed allergy drops as a kid, don’t be too surprised if the body suddenly decides to overreact to its environment. Immunotherapy is the process of desensitizing the immune system to allergens in the environment (dusts, molds, pollens, etc.) Extracts of these allergens are mixed into a saline solution and introduced to the body through shots (subcutaneous) or under-the-tongue drops (sublingual). Over time, the concentration of these allergens is increased until the immune system learns to stop overreacting to them in ways that lead to troubling symptoms. Physicians can prescribe subcutaneous and sublingual immunotherapy. Can patients achieve permanent remission of allergy symptoms (immune modulation)? While many patients start to feel symptom relief within just a few weeks of starting treatment, it can take longer for the body’s immune system to make a habit of its new, improved behavior. As a general rule, we recommend staying on the allergy treatment drops for at least 3 years. After this, some patients are able to stop taking the drops without relapse. Others stay on a basic maintenance dose under the care of a sublingual immunotherapy physician to stay allergy-free. Can sublingual food drops help with related health problems? In addition to helping with standard food allergies, the drops have been shown to help with interstitial cystitis (IC) treatment, eosinophilic esophagitis treatment (EoE), and oral allergy syndrome treatment (OAS). Is sublingual immunotherapy a naturopathic allergy treatment? Naturopathic medicine is a mode of healthcare that focuses on prevention, treatment, and optimal health through elements that encourage self-healing. Sublingual immunotherapy aligns with many principles of naturopathic medicine, including addressing the underlying cause of illness instead of just treating its symptoms.